fashion + lifestyle content creator. regular guy with way too much clothing. Outside of the office, I had the privilege of serving as one of our social brand ambassadors. The ASOS Insider program consists of a special group of international influencers who eat, sleep and breathe (and, of course, dress) the ASOS way. In this role, I was able to connect with our customers in a more direct and personal way, posting my looks, life and inspiration on my personalized ASOS Instagram account: @asos_jovel. My previous stint with Calvin Klein was beyond amazing. It all started with a SS14 video lookbook that my creative partner, Kenneth Kyrell, & I created for Calvin Klein Collection and Hypebeast (you can watch Head in the Clouds right here). From there, we worked on social content, made appearances with the brand as a part of their local influencer team, and even helped launch the #mycalvins campaign. 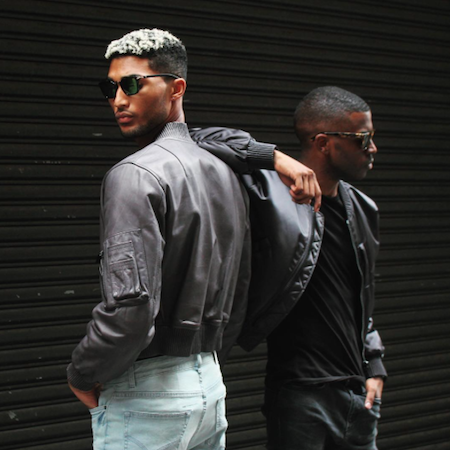 Over the past few months, I've worked with Maniere de Voir as one of their latest brand ambassadors. Stay tuned to my Look Good section for more outfits and sick staples from the UK-based streetwear label. It's always nice when you find a brand that celebrates rising creatives. Remy Martin tapped me for their #OneLifeLiveThem campaign, during which we raised a glass to all the young hustlers out there. This spring, I partnered with Timberland for their #ModernTrail campaign, a 3-month partnership that brought my favorite SS17 trends to life in a fresh, new way. Click here to see some of our work. I'm currently teaming up with Bar III for a special summer style session, spotlighting some of the brand's freshest threads—and showing you how I make it my own. One of my favorite partnerships over the past few months has been with K. Swiss. They signed me on to show how I take on the day #likeaboss (and it was the perfect excuse to update my suit collection). Earlier this year, Liquor n' Poker brought me a brief and a budget, and the rest was history. Haha, no, but seriously, I had a great time creating some social content for the brand's SS17 drops. I recently signed on as a boohooMAN Insider for the U.S. I'm looking forward to partnering with the brand in the months ahead. Check out our first partnership here. Gotta love my buddies over at Forever XXI. We've teamed up a few times over the past years to create fun content that's been seen on my channels, theirs, and e-commerce product pages. I've been a part of some great projects with Perry Ellis. The first was an exclusive Insta-meet with the GQ Insiders. Second and most recently, was their first ever #100PiecesOfPerry Instagram fashion show. Earlier this summer, I teamed up Lucky for a 4-part summer social campaign. I took a few of the pieces down to the Caribbean with me for some sweet shots like the one above. Last spring, I partnered with tigha to create a few shots around their SS16 collection. From the partnership, we got some amazing photos captured and I got the beautiful biker jacket above. This fine leather goods company has become one of my favorite brand partners. The top quality leather duffel seen above goes with me whenever I leave the country. My matching passport holder comes too. Last year, I helped Google promote the launch of their new Google Photos app. More than just doing a quick install and trying it out, they put together an awesome activation to show users just how amazing (and fast) it really is. This past NYFWM, Google outfitted me with a new watch from their Android Wear collection. It's super handy and pretty stylish too, especially with all of the cool digital faces to pick and choose from. I recently teamed up with I.W. Harper Bourbon to create a very special 3-month long summer lifestyle series. Pt. I: an exclusive dinner and whiskey tasting for five of my closest friends. Pt. II: a special style guide for my readers. Pt. III: a spotlight on the brand's limited edition collab with Goorin Bros.
Back in Feb '16, I teamed up with Fab.com for their Upgrade Your Everyday campaign—and it was awesome. On top of getting some fantastic new pieces of decor for my place, I got to help them with their $1k giveaway. A good friend of mine and I were welcomed by Tourism Board of Curaçao for an amazing 3-day stay filled with ostriches, ATVs, and some amazing food. Definitely one of my favorite trips so far. Check out one of my blog posts from the trip here.